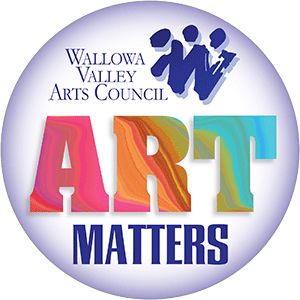 The Wallowa Valley Arts Council has a rich history of leading, promoting, and strengthening the Arts. Join us as we continue to work with our community partners to bring an enthusiastic array of visual images, music, dance, and theater to our valley for your enjoyment, enrichment, and edification. Essential Benefits: Join up with us! The Wallowa Valley Arts Council provides a long list of essential “behind the scenes” benefits to our partners. These include general budget oversight, matching funds for granting opportunities, scholarships, paid professional bookkeeping and year-end tax preparation and filing, maintenance of our nonprofit 501(c)(3) tax-exempt status, website access and direct links, advertising brochures and rack cards, Wallowa County Chamber and Eastern Oregon Regional Arts Council group membership dues, and coordination for event liability insurance coverage. Grants and Matching Funds: For over thirty years, our Council has provided matching money and received grants for events and community improvement projects such as stage lighting at the Enterprise-located OK Theater, and display track lighting for the Joseph Community Center. Presently, we have a fund solely dedicated to the advancement of Music for youth.